Use chalk to color, write on, and decorate this horse! Clean up is easy- just wipe with a damp cloth, and the Chalkboard Horse is ready for a new design. The possibilities are endless! Breyer Model Horses Classics Size is designed for authentic and imaginative play, offering younger collectors realistic model horses and excellent collectibility. 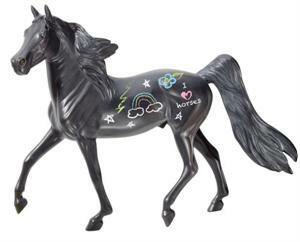 Breyer Classics are created with the same care and devotion as Breyer's Traditional line. Breyer's Classics Size Models are sculpted 1:12 scale.